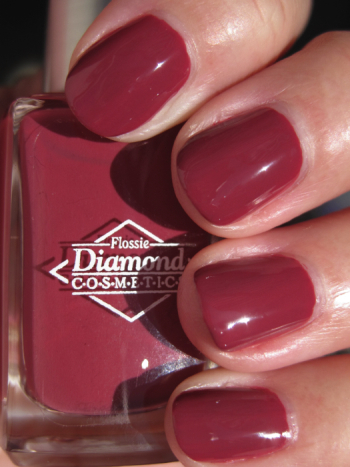 Diamond Cosmetics has four new colors in their winter collection, which I have for you today. The formula on these was really great, as I have found all their polishes to be so far. They are thick, but not sticky and very opaque. A couple of these didn’t knock my socks off, but the other two I really like a lot. Peep them out. Smokey Rose is a smoked out rose pink creme. I actually liked this on me more than in the bottle, but I still don’t think it’s a color I would normally reach for. It’s a little “tame” for me personally. This was two coats. Mulberry Mayhem is a cool, bright berry red. This is a really pretty red, and very shiny but not totally original in my eyes. This was two coats. 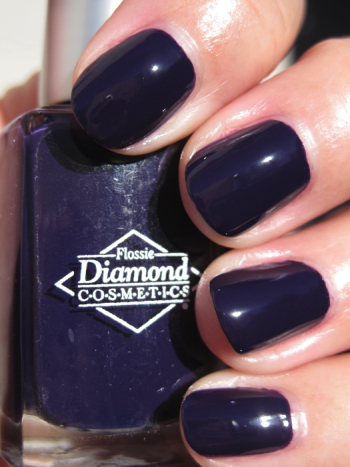 Crushed Velvet is a dark purple creme. I love this because it’s just SO vampy! It does have a tendency to almost look black in low light though. This was two coats. 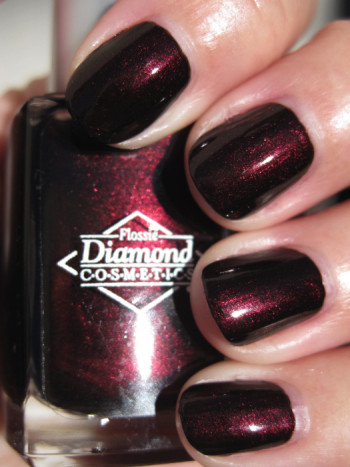 Cherry Tobacco is a “lit from within” blackened red shimmer. I LOVE THIS COLOR. You know by now that I love glowy polishes, they are really stunning on. Whenever I have a color like this on I cannot stop looking at my fingers! I also think the name of this one is really great.This one was three coats. Overall I think this is a good collection. The first two weren’t terribly interesting, but still pretty, and worth owning if you don’t have anything like them. The second two are just gorgeous, and definitely worth owning! You can find these on their website here and remember, these are ONLY $2.00 each, which is amazing for the quality of the polish! I was on their website the other day looking at the swatches and was thinking that I needed Cherry Tobacco! How similar is it to RBL Black Russian (I think that is the one I am thinking of). I might have to pick up crushed velvet too. .-= Solveig´s last blog ..NOTD: China Glaze Strawberry Fields =-. I love the Cherry Tobacco. Very different, doesn’t look like anything else I have. I think I also “need” the crushed velvet. I must have Crushed Velvet and Cherry Tobacco. Must. Have! .-= Selina´s last blog ..Your daily dose of pretty: Kimono Cuties laptop bag =-. Cherry Tobacco is really pretty. And you can’t beat the price. .-= Marisol´s last blog ..Catching up =-. I just got the Cherry Tobacco..I like it, but to me it’s like a mahogany w/red shimmer…def. browner than it looks in other pics on the Internet. I just recieved the Cherry Tobacco yesterday. It’s def. darker and browner in person(to me anyway)..more like mahogany w/ red shimmer. I’ve never had RBL Black Russian..but I heard it’s a dupe of China Glazr Lubu Heels..which is black w/red shimmer,Sonya. The cherry tobacco looks pretty. .-= dramaqueensmum´s last blog ..Tara was in the paper =-. Idk why but im actually really diggin on the smokey rose. It seems like a nice departure from your typical pretty pink. And since u asked if anyone had fun plans for the weekend i jus thought id share that im having the best weekend in a long time. We had a pretty bad fire at our house last january and the reconstruction is finally done and we get to move back home this weekend! We have a lot of work still ahead of us to get things back to normal but its realllllly good to come home. Wish me luck! Cherry Tobacco and Crushed Velvet and my two favorites. The Cherry has a beautiful glow. .-= Helen´s last blog ..China Glaze Wagon Trail =-. Thanks Kelly and Rachell, for the clarification on Black Russian. I found a swatch of it online and realized that it it more similar to Lubu heels than Cherry Tobacco. I am definitely going to get Cherry Tobacco, beautiful!